April 29, 1996, JPL. 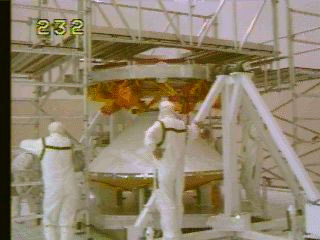 Engineers and technicians hang the Mars Pathfinder spacecraft in its "cruise" configuration inside the 25 ft space simulator facility at JPL. 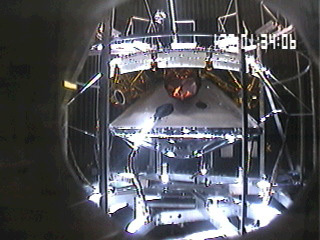 The simulator tests the ability of the spacecraft to withstand the deep cold and vacuum of space while also exposing the top side (the cruise stage side) to the intense heat of the Sun. May 1, 1996, JPL. Nitrogen-chilled walls bring the outer temperatures surrounding the vehicle to ultra low temperatures while concentrated xenon arc lamps, focused from above, simulate the Sun. Also surrounding the vehicle are infra-red lamps that are used to simulate the effects of the Sun when the spacecraft solar arrays are not pointing directly at it. June 25, 1996, JPL. 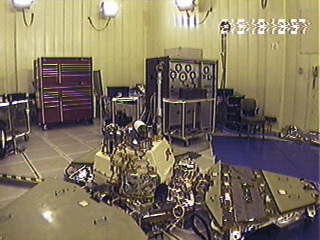 Integrated systems tests inside a clean room at JPL gave engineers their first opportunity to operate the lander and the rover. 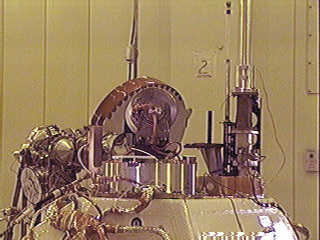 The IMP camera, shown here in its stowed position (center), scans the horizon in the early morning looking to find the Sun. 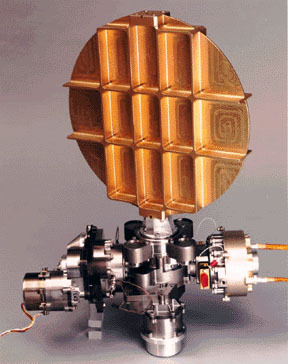 Once the Sun direction is known by the on-board software, the lollipop-shaped high gain antenna (behind the camera) will then be automatically pointed toward Earth. June 25, 1996, JPL. 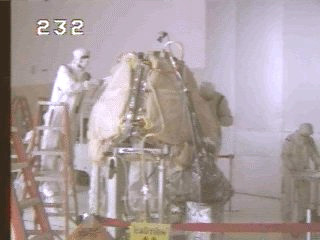 The rover is shown here not long after the first test of its egress from the lander. The rover's electronics are well insulated from the cold of Mars, so to work at room temperature, it must be kept artificially cool. 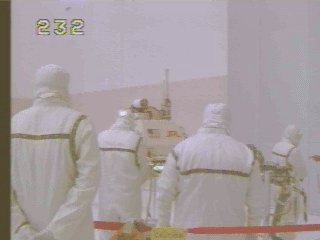 A tube of cold air follows the rover on its first journeys about the clean room floor. July 9-11, 1996, JPL. 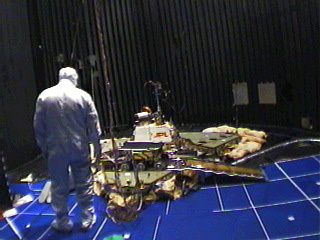 Soon after the system test, the flight lander and rover are placed on the blue floor of the 25 foot space simulator. July 9-11, 1996, JPL. This facility simulates the thin atmosphere and the large daily temperature excursions on the surface of Mars. August 2, 1996, JPL. 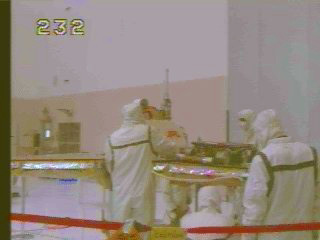 Back in the clean room at JPL, one final set of integrated systems tests allow the mission team to gain operational experience using the actual flight hardware and software. The solar arrays are protected against potential biological contamination with clean greenish covers. September 30, 1996, KSC. A few weeks after arrival at SAEF-2 at KSC, the lander has been unpacked and tested. 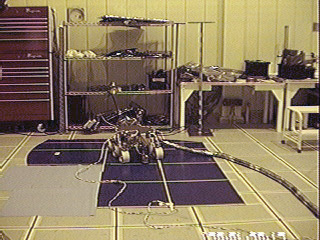 Final assembly operations include mounting of rock membrane protection of the solar panels on the petals, final rover installation, bridle installation and the addition of the American flag. Details of the final implementation are reviewed and approved during assembly walkthroughs by Quality Assurance as well as by many experienced engineering experts. September 30, 1996, KSC. Airbag installation on the open petals is accomplished smoothly by the experienced airbag design, test and manufacturing team. Following them, the ATLO Electrical Test Team performed the first of many integration tests and final preparations for launch. October 5, 1996, KSC. 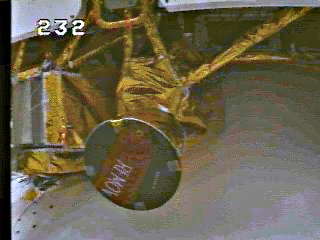 Finally the lander petals are closed for the last time. This operation turned out to be more complex than expected due to the need to add shims near the petal hinge line in order to preload the closed petals and the impact that had on the petal latch separation implementation. Within two days, the problem was resolved and the petals bolted closed for the last time. October 16, 1996, KSC. 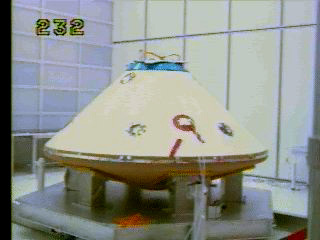 Just over one week later, the backshell is lowered over the lander, bolted in place and the heatshield is raised from below to bolt to the backshell. The lander and rover are now all but inaccessible while in this "entry vehicle" configuration. October 18, 1996, KSC. 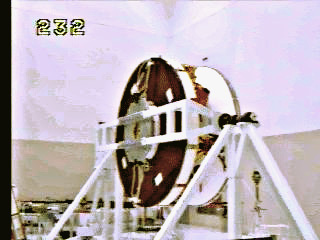 The entry vehicle is then turned over and mated to the spin table in the clean room. There it is spin balanced at 70 rpm to detect and remove unwanted wobble, much like an automoble tire is balanced. 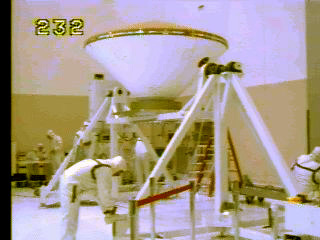 The entry vehicle enters Mars' atmosphere spinning at 2 rpm. October 21, 1996, KSC. From the spin table the vehicle is lifted off of the table and turned using the specially-built "turn-over" fixture and placed under a work gantry. October 22, 1996, KSC. While under the work gantry, the cruise stage is gently lowered unto the entry vehicle. The cruise stage provides solar electrical power to the lander electronics during the cruise phase of the mission and houses the propulsion subsystem and attitude control sensors. October 22, 1996, KSC. 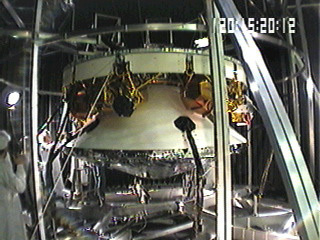 Now nearly fully assembled, the Mars Pathfinder spacecraft is shown hanging from the turn-over fixture. 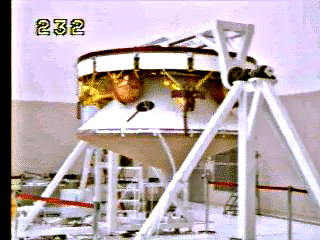 The golden-brown sphere under the cruise stage is one of four hydrazine tanks that supply propellant for attitude turns and trajectory correction maneuvers. October 25, 1996, KSC. A closeup of the star scanner on the cruise stage with its protective red and black cover. 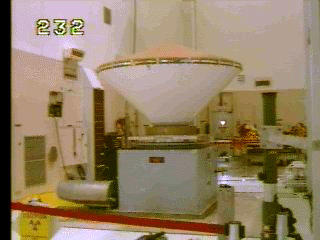 As the spacecraft rotates at 2 rpm during cruise, the star scanner sweeps out a slice of sky reporting stars of different magnitudes to the attitude control software executing in the lander computer. 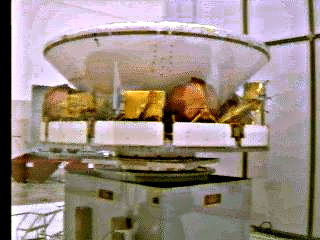 The lander computer stores a star catalogue of about 200 stars which it uses to determine its orientation in space. The attitude control software also uses Sun direction information from five Sun sensors strategically placed around and on the cruise stage. October 30, 1996, KSC. 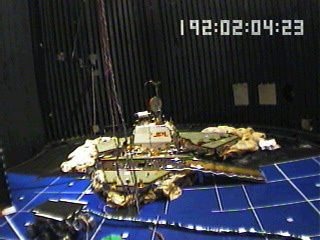 The spacecraft is flipped once again in preparation for fuel loading of the hydrazine tanks. November 4, 1996, KSC. Propulsion technicians perform the delicate fuel loading operaton under the watchful eyes of experts. 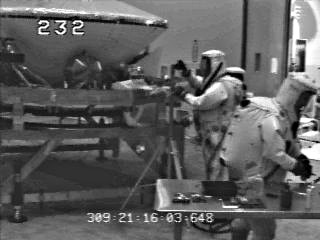 Due to the extreme flammability and causticity of the fuel, they must wear self-contained breathing equipment and rubberized suits. November 5, 1996, KSC. Once fueled, the whole spacecraft undergoes another spin balancing test at 70 rpm to eliminate wobble in the cruise configuration. Like the entry vehicle, the spacecraft in the cruise configuration rotates at 2 rpm on its way to Mars. December 4, 1996, Cape Canaveral. 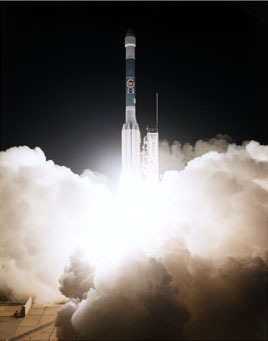 Mars Pathfinder was successfully launched at 1:58 am EST (10:58 pm PST) on a Delta II rocket from Pad 17b at the Cape Canaveral Air Station. It is now on its way to Mars and will arrive on July 4, 1997! Check out live pictures from the MarsRoom and Mission Operations Area at JPL!